2 Bedroom Terraced House For Sale in Marlborough, Wiltshire for Guide Price £325,000. 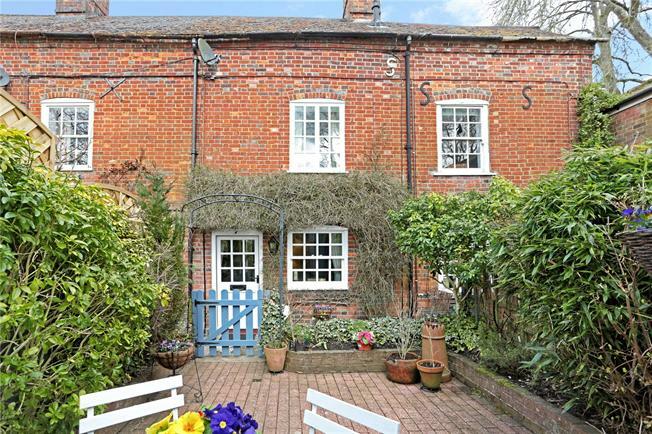 An appealing and truly charming Grade II listed two bedroom town house offering stylish and well presented accommodation with an attractive courtyard garden and set in a tucked away position just off Marlborough’s historic high street. The house is arranged over 3 floors and provides light and airy accommodation throughout with much character. The kitchen/breakfast room is fitted with a good range of cupboards and has ample space for a table, a glass lantern window makes this a lovely light room. The sitting room has a gas fire with built in cupboards to the side recess. There is a double bedroom with fitted wardrobes and a modern bathroom on the first floor with a further double bedroom with a range of fitted wardrobes on the 2nd floor. In all this is an excellent town house. The property benefits from gas central heating throughout. The old market town of Marlborough provides an extensive range of shopping facilities, a twice-weekly market, a public library and various restaurants, pubs and shops. The town is well served by a good range of schooling and benefits from a sports centre with an indoor swimming pool. Access to the M4 motorway junction 14 and 15 is approximately 10 miles, and the expanding commercial centre of Swindon is about 12 miles from which there is a regular Intercity rails service to London Paddington. Further Br stations can be found at Great Bedwyn and Pewsey. The countryside surrounding the town is designated as an Area of Outstanding Natural Beauty and includes nearby Savernake Forest, and the property sits within a conservation area. The cottage is set off Wellington Place and accessed off the high street. There is a pretty paved courtyard garden to the front, set with mature shrubs and with a timber garden shed. The sunny courtyard is south westerly facing. Easy access for Town Centre.